Have you ever gotten down and dirty with a martini? Enjoy a classic dirty martini to kick happy hour up a notch. 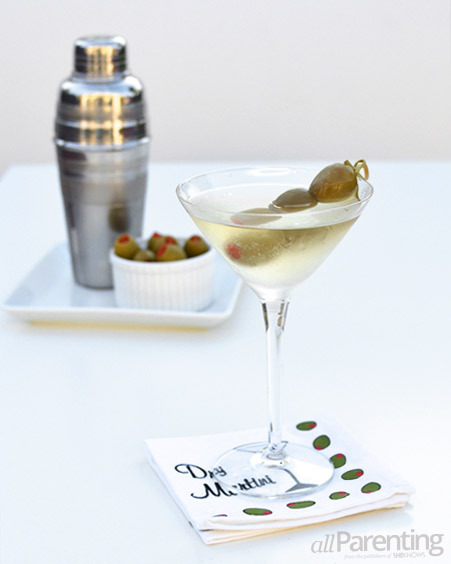 If you love green olives or a little salty twist to a cocktail, a dirty martini is a must-try cocktail! While the history and origin behind the dirty martini recipe remain disputed and a hot topic for martini enthusiasts, today they have become more popular than ever. The dirty martini recipe and drink owes much of its recent popularity to everyone's favorite spy, James Bond. The dirty martini recipe is a true classic and a relatively simple cocktail to make. The dirty martini recipe involves adding olive juice or brine to clear alcohol which gives it a brownish-green color and murkiness or cloudiness. This makes the martini look "dirty." A classic martini is made with gin, but for a dirty martini, you can use either gin or vodka. Place the gin or vodka, martini shaker and a martini glass in the freezer for 30 minutes. Fill your martini shaker with ice. Add the gin or vodka, dry vermouth and olive brine to the shaker and shake vigorously until well combined. Pour into your chilled glass. Garnish with stuffed green olives. Enjoy!